On 26th November 2012 Ing. 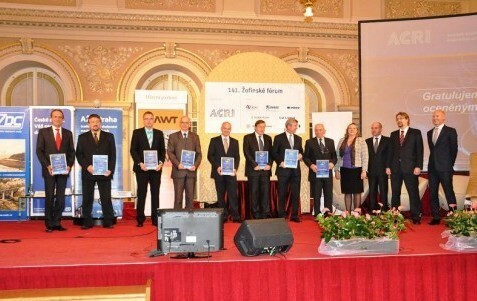 Vladimír Zikmund, representative of ZKL Group, took over Annual Award “ACRI 2012” from hands of Mr. Pavel Dobeš, Minister of Transport, Mr. Petr Žalud, General Director of the Czech Railways, Mr. Ji?í Kolá?, General Director of SŽDC and Ms. Marie Vopálenská, General Director of ACRI. Official ceremony concerning an announcement of results of the ACRI annual award competition was held this year within the 141. Žofín Forum in Prague. Special guests and beautiful environment gave the event a very respectable atmosphere. ZKL Group received the Annual Award in the category “Components” for a new generation of ZKL axle bearings for axles of modern vehicles. It’s an award for this year’s results of ZKL in this business, which we very appreciate. After all, this year we have managed to achieve really enough. For example, we realized a significant innovation of axle roller bearings, which has solved the problem with labour intensity of assembly, but also with a new cage was achieved an improvement in functional properties of bearings. The tests of bearings have been validated for speed of 200 km / h. But mainly, in our company there have been developed new types of bearings, for modern rail vehicles, which expand product range of tapered and roller bearing units of ZKL. These bearings are primarily intended for use in new rail vehicles, operated on railways and also in public transport in our country and neighbour states.